Chosen because Monday is April Fool's Day. 1) As an April Fool's prank, Taco Bell once announced they had purchased The Liberty Bell and renamed it The Taco Liberty Bell. Describe your perfect taco. I like soft tacos with meat and cheese only....I know, I know...so boring. Sour cream would be ok too. 3) In 1998, Burger King got in on the April Fool's Day fun by promoting a special "Left-Handed Whopper," designed to be easier for a leftie to hold. Describe your perfect burger. This is so embarrassing...you guys are seeing what a 3 year old I really am. I like a cheeseburger with ketchup only. 4) In 1962, when color TV was still new, a Swedish station pranked viewers by telling them they could convert their black/white sets to color by cutting up a nylon stocking and stretching it across the screen. Of course, in 1962, more women wore nylons and screens were smaller. How big is your TV? Are there any nylon stockings in your home? 55 inch...and I have some colored ankle nylons to wear with flats and slacks....not any full nylons, I haven't worn those in years. 6) When Crazy Sam was growing up, her mother would surprise her on April Fool's Day by slipping a rubber worm or plastic spider in her lunch box. When you were in school, did you more frequently brown bag it or buy your lunch in the cafeteria line? cafeteria, but I liked the lunches when I was in school...the lunches now are gross. I take my lunch everyday. 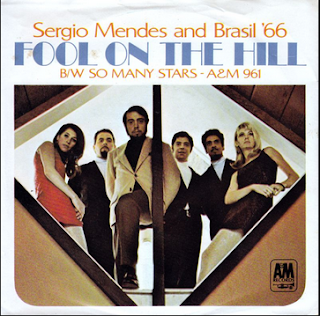 7) This week's song was an international hit for Sergio Mendes and Brasil 66. Because of the song's bossa nova arrangement, everyone assumed the lead singer, Lani Hall, was Brazilian. She was a folk singer from Chicago. Sergio Mendes discovered her at a charity benefit. Can you think of a time when doing good really paid off for you? I can't think of anything right now, but no matter what, I will always do the right thing. 8) In 1968, when this record was popular, Pierre Trudeau became Prime Minister of Canada. Today his son holds that office. When did you most recently visit our neighbor to the north? I have never been to Canada. I used to be a ketchup only gal... but now I have added in the pickles. My favorite lunch day at school was pizza day...loved those rectangled pizzas! Have a great Saturday! I love the look of your Easter blog.. so cute!!! have a great weekend!!! I long ago decided I had the tastes of a 5-year-old. In fact I told my doctor earlier in the week that I thought chocolate was the 1st of the five food groups. She laughed and then wanted to know if I was eating dark chocolate or milk chocolate! Your taco sounds just like what I might order. (Extra grease, please. HA!) Aside from Friday's chili-con-carne, I always brown-bagged it to school. Mother always packed the same thing: bologna on buttered white bread with a bag of Frito's. I live so close to Canada--it's a regular stop. Crazy Sam gave us another fun Saturday 9! I enjoyed your answers. I like our school lunches back in the day too!! Happy weekend! I love how TV's have gotten so big. I remember when 19 inches was a good size for a TV. Now, I'd be squinting to see anything on that size TV.